I made this glaze today for some salmon that will be cedar-planked on the grill for dinner tomorrow, so I thought I'd post it. As the name implies, it's an Asian-inspired glaze that is great on anything grilled where a little sweet-and-sour eastern influence is welcome. 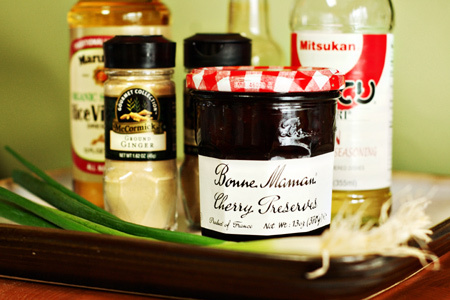 The cherry preserves and hoisin sauce work magically together, and the white pepper adds a bit of a spicy finish. It's simple, but it does incredible things. Add all of the ingredients, except the water, to a small sauce pan. Put the pan over medium heat and bring just to a simmer. Let it simmer for five minutes, then remove from the heat. Put the sauce in a small bowl or jar and add the water. Blend with a stick blender for just a few seconds to get rid of any cherry chunks. Let cool and use as you would any glaze, and enjoy! Anonymous - Please let me know what you think.